We've been asked the question, "What can you build with Fort Boards?" many times and the answer we usually give is, "nearly anything you can imagine". But then we get the follow up question, "What about ______?" The blank that people have been asking a lot about is Star Wars related builds. 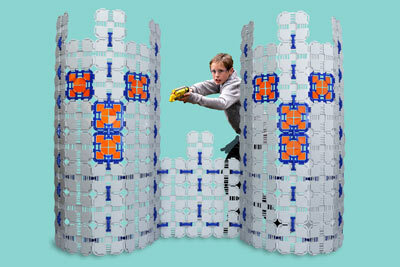 Yes, with Fort Boards you can build really big, almost life-sized versions of some of your favorite Star Wars toys. In about a month from now we will be releasing the gray colored Fort Boards that are going to be perfect for building something that resembles the Millennium Falcon or the Death Star as seen below. And as you can see below, with a couple of packs of Fort Boards you can build something that looks like an X-Wing (that will fit an adult) and a R2D2 like robot (that would fit a child). Fort Boards are a wonderful toy for open-ended and imaginative play and they are also an awesome toy to carry out your intergalactic battles with. We'd love to see any of the builds you create too! Send your photos to info@fortboards.com or tag the photo with #fortboards so that we can share your creativity with others!